In Church, music helps to increase our grace before God and whoever views it only as an aesthetic pleasure or as a religious concert suffers a loss of perspective. It is of huge importance that the men and women who make up the choir are spiritual people and are always striving to sing from the heart. (Theophan the Recluse, 19th century). Prayer is movement, an action of the soul; it is the need to establish a permanent line of communication with the Creator: “it is an act of collaboration between man and God”. It doesn’t take the form of mere contemplation, nor is it limited to repetition; it seeks solitude, but is not indifferent to the world: its purpose is universal redemption through personal salvation. Facing this search for dialogue with the Divinity, human beings share the same anxiety; in uniting their souls in a single spirit, not only have they wanted to show the Lord their struggles, their worries and their desires: they have also offered praise and thanks for His power, for His glory. For these reasons, the human voice has served as a valuable instrument in pursuing the ideal of unity through message: collaboration, coupled with faith, speaks to the Lord in a common tongue and is felt by Him as though it were a cool, summer breeze. Religions aspire to remain in this mystical conversation and have created, through collective song, superior means of communication for speaking and receiving the Divine Word: the Lutheran choir, the Roman Catholic Gregorian chant, and the sacred Buddhist song, are a few examples. The byzantine chant presents itself as a bridge which brings the Creator and his creations closer together and whereon prayer is strengthened and achieves a greater power of convocation insofar as the soul becomes more open to spiritual dialogue. At the heart of all of this is God: without Him, these same songs would be rendered useless, empty, without feeling, artificial; with Him, the faithful can expect word of eternal life. During the medieval period until the fall of the Byzantine empire, a widely-shared idea in theology and mystical speculation developed in Greece was the transmission of the sacred song by angels; this concept gains further support when we recognise that some hymns used in Church, as tradition has it, are of celestial origin (such as Amen, Hallelujah, Innocent and Glory, among others). Both in the Old Testament (Isaiah 6: 1-4) and in the New (Apocalypse 4: 8-11), the aforementioned affirmation is corroborated and, through this, the early Church believed in a mankind united in the prayer of the angelic choirs. 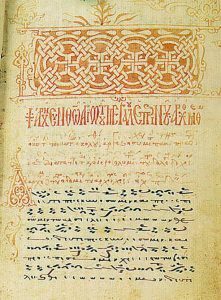 Writings from the first Fathers of the Church such as Clement of Rome, Justin I, Ignatius of Antioch, Athenagoras of Athens and Dionysus the Areopagite, as well as liturgical treatises from Nicholas Kabasilas and Symeon of Thessalonica, express this belief and the importance of music in worship. Accordingly, it was inconceivable for a composer to put their name on a manuscript during this time. Since the birth of the Christian Church, singing comprised an integral part of worship. At the Last Supper, Christ and his disciples sang hymns before they left for the Mount of Olives (Matthew 26: 30; Mark 14: 26). Later, in his letter to the Ephesians, St. Paul advised: “Fill yourselves with the Holy Spirit. Speaking amongst yourselves in and busying yourselves with psalms, and with hymns, and spiritual songs, singing and praising the Lord in your hearts.” (Ephesians 5: 18-19). At its origin, Christian practice took the rich Jewish tradition as a model and continued its history of singing psalms, gradually adding new hymns with specifically Christian content; thanks to them, they were able to express the strength of their faith during the persecution of the first centuries. To be entirely vocal, the music had to remain in faithful service of the text. Melody had its origins in, and was created solely for, this very purpose. Composers were, therefore, principally men of prayer, mystical fathers and devotees, far more so than poets or professional musicians. Contained within their hymns are objective declarations, never subjective: each verse, each stanza, is a wonderfully poetic affirmation of faith. During the first years of the Church, participation in celebrations was divided, quite simply, between the clergy and the parish; the faithful, when it came to their turn, responded with simple, accessible melodies. Before the 4th century, the bond of unity between the clergy and the townspeople in the liturgical ceremony was close, even strong. This koinonia (or “Communion”) can be applied to the early use of the word choros: it referred to the congregation as a whole, not to a separate group responsible for the musical aspect of services. 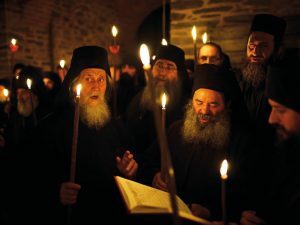 The parishioners always had an important role, reciting or singing psalms, responses or hymns; because of this, the words choros, koinonia and ekklesia were used synonymously in the early Byzantine Church. Choros was also used in the Septuagint (a translation of the Old Testament into ancient Greek, extensively used by the first Christians) in Psalms 149 and 150, to translate the term machol (dance); therefore, the Church adopted this word from classical antiquity to indicate singing and the congregation in worship, in Heaven as on Earth. Later, just as happened in the rich Jewish tradition, various songs became more complex and specialized singers, with them, grew in necessity. The Hallelujah, for example, contained elaborate musical passages and required people with greater musical aptitude and true devotion to sing it. Thus appeared choirs in churches. The choir, now being a group separate from the gathered faithful, grew in response to a major development in holy music; it was necessary to rely on singers who, in interpreting very elaborate melodies or ones presenting a real degree of difficulty, would represent the town in sublime praise of God. In these first years, musical participation shared between the clergy, a group of singers and the parishioners, similar to Jewish tradition, began. Antiphonal singing allows singers to perform for long periods of time without exhausting themselves, and lends a splendour and dynamism to celebrations which, in turn, keeps parishioners enthusiastic. It is because of this that what has long been a custom of the Church can still be heard today. Beyond having an aptitude for singing and a proven moral resolve, those selected to form the choir should have an infallible knowledge of liturgical services and the books used in them. Once accepted as members, they had their heads shaved in a special rite. Although they wouldn’t reach the level of the clergy, singers were a nonetheless a distinct and important group. In further reflection of this, canon XV of the Synod of Laodicea permitted only the psaltai (singers) to take part in services: “No others shall sing in the Church, save only the canonical singers, who go up into the ambo and sing from a book”. This decree didn’t prevent the assembly’s involvement in the form of communal responses, such as Amen, And with your spirit, Lord have mercy, among others, which have always been part of tradition. During this gradual separation of choir and village, the former came to acquire its own special area in the Church, near the Sanctuary (where the Altar is located). The term choros began to be used in liturgy to refer to certain clerical activity and, in time, gained synonymity with the kleros. Telling of Byzantine chant invariably plunges us into the Near East of the first centuries after Christ and into the Orthodox Church which has kept the traditions alive until the present day (much like the Roman Catholic Church has done with Gregorian chant); it is exclusively holy music, sung predominantly in unison and undertaken by the psaltis (singer) or by the choir (typically all-male), without musical accompaniment. 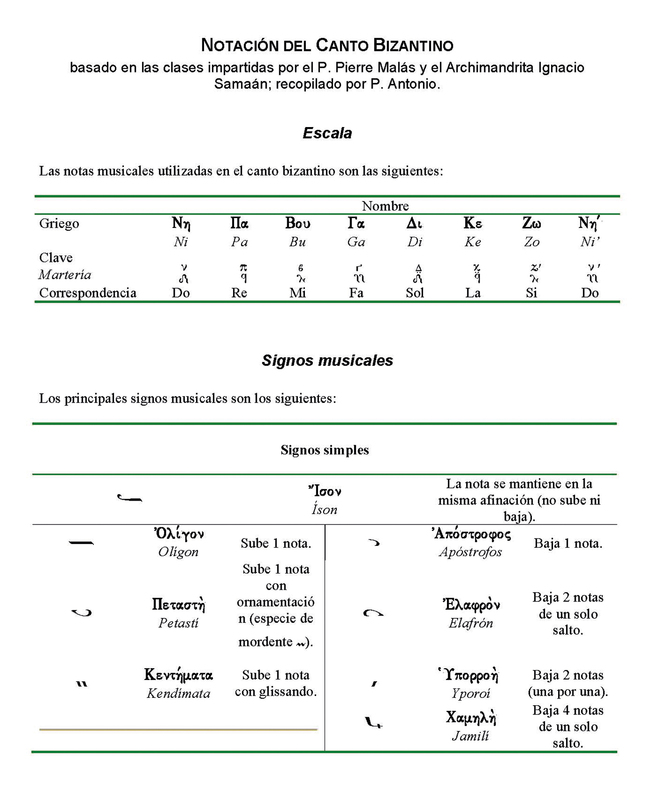 In the 19th Century, western influence has seen the addition of the isocratima (a type of drone) to the main melody: this is a group of singers who assume the íson or pedal note which supports the monody. Strictly speaking, byzantine music the holy singing of Christian churches which follow the orthodox rite. This tradition, which spanned the Greek-speaking world, flourished in Byzantium from the establishment of its capital, Constantinople, in 330AD, up until the city’s fall in 1453.. Combining use of Jewish music with technical and artistic methods hailing from the time of classical Greece, the diversity of its origins is undeniable; additionally, it is inspired by the monophonic vocal music that evolved in the first Christian cities of Alexandria, Antioch and Ephesus. Its Golden era began in mid-5th century Constantinople, Jerusalem, Alexandria and Antioch. Until the 11th century, almost all of the text for hymns was composed by musical poets: St. Roman the Melodist (5th and 6th centuries), St. Sophronius, Patriarch of Jerusalem (638), St. Andrew of Crete (660-740 approx. 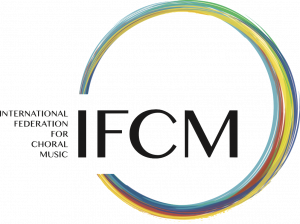 ), St. Cosmas of Jerusalem and St. John of Damascus (7th and 8th centuries) to whom tradition attributes the creation of an eight Tone (melodic scales) system and the organisation, by consequence, of the hymns found in this system. In the following centuries, the music has grown whilst remaining faithful to models established in its early stages, especially the character indicated by the Tones in which a given hymn was originally composed. Notation, too, has evolved to include a series of signs which detail the intervals by which the Melody ascends or descends. Just like a text, the music can be read in lines, as opposed to Western notation in which the stave features the notes at different heights. During the 10th and 11th centuries, monks introduced elements of Turkish music, (in particular, the 6 Tone), drawing out a greater feeling of mysticism in the chants. Later, in the 12th century, melodies were composed in a rather more strict and rigid style, in syllabic form (one syllable per note); From the 13th century to the 15th, became more elaborate and complex, taking on a melismatic style (in which one syllable can be sustained over various successive notes). Johannes Kukuzeles, an innovator in the development of Byzantine music, stands out as one of the great composers of this time. The melismatic melodic form became a permanent adoption, constantly acquiring more of an improvisational character. Up until the end of the 18th century, the original repertoire of medieval manuscripts was replaced little by little with more recent compositions and the basic modal system underwent significant transformations. With each change, notation became less intelligible, begetting, in response, the idea of Scriptural reform. Gregory of Crete (died 1816) was the first to attempt it; his endeavour was continued by his disciple Chrisanthos (1770-1846 approx.) who introduced several concepts from Western music and was exiled for his troubles. Later, on returning to Constantinople, he accomplished a reform of musical notation and teaching that stands today, alongside Gregory the Protopsaltes and Chourmouzios the Archivist. 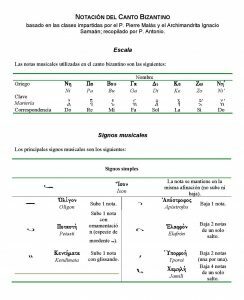 It is language pertaining to musical notation whose roots date back to the 5th century in the Middle East and Greece; Byzantine chant is written in it and, as with the text, it is read in a linear manner. Its history has gone hand in hand with the development of Greek Scripture ever since prosodic signs (accents and other reading signs introduced by grammaticians to dictate vocal intonation, among other things) began appearing in Bible passages (6th century) which, during this time, were only read. Upon the return of more indulgent worship, readings in song lent greater solemnity to the ritual. 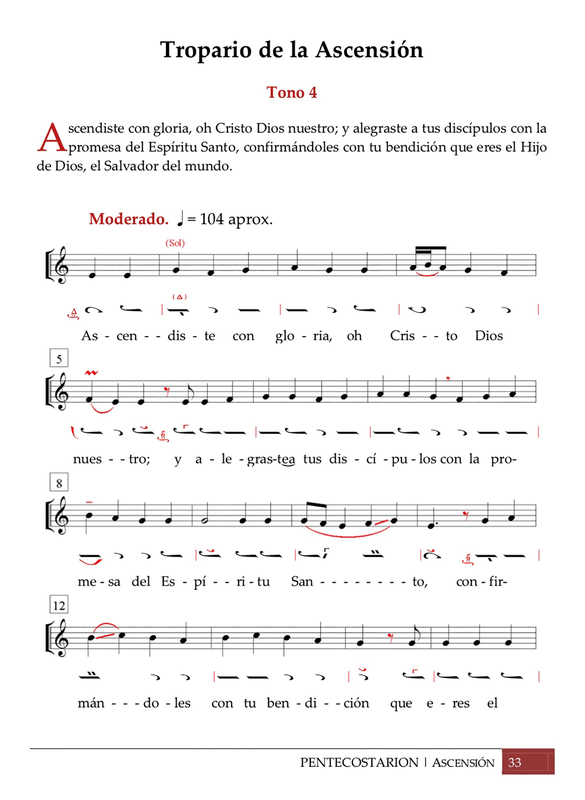 With the passing of the centuries, interpretational indications for the chant have become more complex and, consequentially, notation evolved at a rapid rate up until its final structuring in the 19th century. 20th century composers, such as England’s Sir John Tavener (in his famous Song for Athene), Poland’s Krzysztof Penderecki (in his beautiful Pieśń Cherubinów or Song of the Cherubim), Rodión Shchedrín (in the mystical Запечатленный ангел or The Sealed Angel) and, to a lesser degree, Stravinsky (in his Отче Наш or Our Father) and Rachmaninoff (in the monumental Всенощное бдение or Vespers) have used elements of Byzantine music. CONOMOS, Dimitri. “Orthodox Byzantine Music”, en A companion to the Greek Orthodox Church. Department of Communication, Greek Orthodox Archdiocese of North and South America. New York, 1984. UPSON, Stephen H. R. Historia de la Iglesia. Iglesia Católica Apostólica Ortodoxa Antioquena en México. México D.F., 1997. La Sagrada Biblia. Trad. Félix Torres Amat. La Casa de la Biblia Católica. Editorial Reymo S.A. de C.V. Colombia, 2002. WELLESZ, Egon. Música Bizantina. Editorial Labor S.A. Barcelona, 1930. ADAMIS, Mihalis. “La Musique Byzantine”, en el disco The Divine Liturgy of St. John Chrysostom. The Greek Byzantine Choir. Lycourgos Angelopoulos, director. Opus 111. 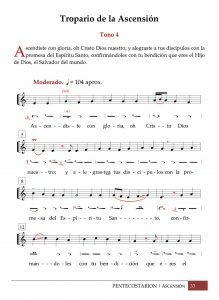 MATTA EL MESKIN: Consejos para la oración. Narcea S.A. de Ediciones. Madrid. 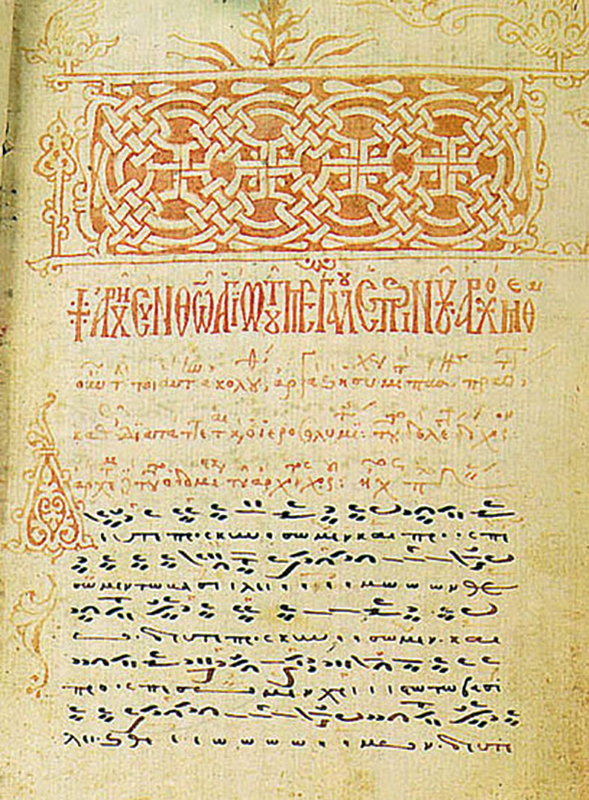 CONOMOS, Dimitri: “Orthodox Byzantine Music”, en A companion to the Greek Orthodox Church. Department of Communication, Greek Orthodox Archdiocese of North and South America. New York, 1984, p. 108. La Sagrada Biblia. Trad. Félix Torres Amat. La Casa de la Biblia Católica. Editorial Reymo S.A. de C.V. Colombia, 2002, p. 1138. UPSON, Stephen H. R.: Historia de la Iglesia. Iglesia Católica Apostólica Ortodoxa Antioquena en México. México D.F., 1997, p. 150. UPSON, Stephen H. R., op. cit., p. 151. CONOMOS, Dimitri: op. cit., p. 109. UPSON, Stephen H. R., op. cit., p. 155-156. UPSON, Stephen H. R., op. cit., p. 156. CONOMOS, Dimitri: op. cit., p. 107. ADAMIS, Mihalis. “La Musique Byzantine”, on the DVD The Divine Liturgy of St. John Chrysostom. The Greek Byzantine Choir. Lycourgos Angelopoulos, director. Opus 111, p. 12. WELLESZ, Egon. Música Bizantina. Editorial Labor S.A. Barcelona, 1930, p. 88.